A national, innovative approach to financial aid is needed to increase post-secondary educational access and completion, especially for students from lower socio-economic backgrounds. A reduced borrowing initiative is critical considering the tremendous growth in national debt related to higher education borrowing. Established in 2013, Earn to Learn operates the largest and most successful matched-savings scholarship program in the country. It combines student savings with scholarships, financial education, and college success coaching to help low- to moderate-income and underrepresented students obtain a college education and graduate ready to enter the workforce with little or no student loan debt. Students and their families who income-qualify deposit $500 into a savings account each year which is then matched 8:1 through combined university support and other public and private philanthropic funding. These combined funding sources bring the student’s total available funds to $4,500 per academic year, to be used for tuition, books, fees and other approved educational-related expenses. This holistic model is already yielding impressive results. Initial data demonstrate Earn to Learn’s first-year retention rate approaches 90%. More than half of Earn to Learn students are first-generation college students, who often have difficulty financing college while also balancing the challenges of daily life. Earn to Learn can be the difference between dropping out and earning a degree, which may alter the course of their lives. Students are supported in graduating from college at rates well above the national average, with nearly half of these graduates avoiding any student loan debt. Those who do borrow are expected to carry much less debt than other borrowers. Earn to Learn changes lives and makes higher education more accessible to those who may not otherwise have considered that they, too, can share the American dream of achieving advanced educational attainment. Earn to Learn is a revolutionary “savings to scholarship” program that empowers low- to moderate-income students in Arizona to successfully complete college through matched-savings scholarships, financial capability education, and success coaching. Eligible students who complete the personal finance training program and establish a habit of savings by making a minimum of six consecutive deposits totaling $500 in an Individual Development Account can receive an 8:1 match on their savings, up to $4,000 per academic year. 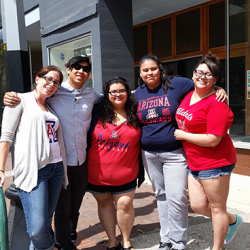 These funds can be applied to tuition and tuition-related costs at Arizona State University, Northern Arizona University, or the University of Arizona. Earn to Learn is a collaborative effort between the Arizona Board of Regents, ASU, NAU and UA. It is designed to provide students with the opportunity, incentive, education and support critical to become a successful college student. The program is supported by financial institutions, businesses, nonprofits, educators, credit counselors and others committed to enhancing the economic well-being of Arizonans. These organizations recognize that higher education is the primary mechanism of upward economic mobility for low-income individuals and is essential to reducing poverty and improving local communities. Receive ongoing support and connections to available resources throughout their time in high school and college. Earn to Learn was founded in 2008 by Kate Hoffman under the name “Live the Solution.” Kate’s dream was to empower individuals to become financially competent and build lifelong assets such as education and homeownership by developing the habit of saving in an Individual Development Account. When Kate learned about Assets for Independence, a program of the U.S. Department of Health and Social Services, she had the idea that our state universities could apply for these funds and bring millions of dollars in assets to the table for struggling college students and their families. The joint application of Earn to Learn and the Arizona universities for these dollars was the first time in the history of the Assets for Independence program that a state public university system applied directly to, and was funded by, the federal program. Since January 2013, Earn to Learn has focused solely on college education and has procured over $8.5 million in new federal funding for the state of Arizona. With the partner universities matching these federal monies dollar-for-dollar, the total scholarship pool is nearly $17 million. As a result, Earn to Learn is now the largest education matched-savings scholarship program funded by the U.S. Department of Health and Human Services in the nation, and has the capacity to offer an unprecedented 3,600 scholarships to students in need through 2020. With the focus on college education and the flagship program, in 2015 Live the Solution was re-named and branded Earn to Learn. The organization has caught the attention of policy makers, legislators, educators, funders and change agents across the country as a model program for changing the face of needs-based financial aid and giving families a pathway out of poverty through college education.